I've been a member of SM Advantage Card (SMAC) since I started working. I frequently shop at SM Malls so I am able to maximize this loyalty card. Just recently, I was purchasing something from Ace Hardware when I remembered that I haven't gone to an ATM to withdraw. Good thing the points I have in the card was able to pay the things that I intend to buy (it is just less than Php200.00). Convenient right? 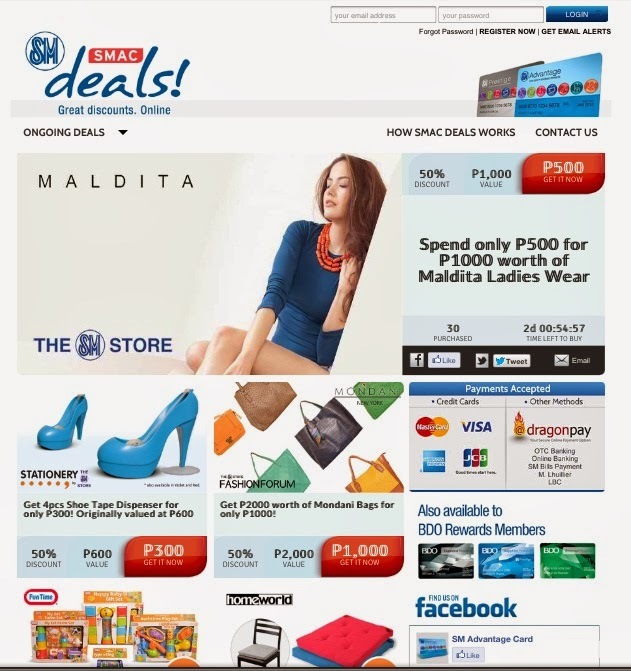 Now, SMAC already have their own site for good deals. I am not sure when they launched this site but upon checking it, they have ongoing deals of vouchers that go as low as 50% off! If you are used to buying vouchers from other group buying sites, it works the same way. It's just that their deals are mostly from their store partners. So hurry and check their site to see if you can find a deal that you will like. Have fun shopping!